January can be the cruellest month for an online journal – especially if the editor wants to have a week or so off over Christmas and then decides to move house. Unfortunately Rochford Street Review is basically a one household band – so when that household packs everything in boxes for a few weeks and moves, the journal has to move as well. RSR has now emerged from a number of book boxes, internet access has been restored and we are ready to face the world again! The present site is a pilot that has been developed with the support of the Writing and Society Research Centre at the University of Western Sydney. To begin with, the Sydney Review of Books has been conceived as a free online publication, in order to maximise its reach. After the initial posting of essays, new critical articles will be added at weekly intervals over the next two months. The funding of such an initiative is beyond the resources of the Centre alone. In offering you this selection of high quality criticism, by some of the best critics and writers in the country, we hope to enlist your support as readers, and that of funding agencies and sponsors, to ensure that the Review can continue as a dynamic contributor to our literary culture. I guess there are a number of models you can use when starting up a literary journal, whether it be a creative journal or a journal of criticism. One model is to start with a sustainable model, one that you know can last for a period of time, and hope to build readership and support (both financial and non financial) as the journal grows. Another model is to start with a bang and hope to attract the government funding bodies and private sponsors as quickly as possible. Both models have their advantages and disadvantages. Rochford Street Review was very much set up on a sustainable model with the intention of being able to run on the smell of an oily rag. While we have managed to do that for just over a year, growing our reading and reviewing base, the recent outage during January shows just how close we are sailing to the edge. The other thing I regret is not being able to pay reviewers. We have investigated a number of options to raise funds to do this even on a temporary basis – we asked for donations through a supporting subscription model, but did not attract the level of support we had hoped for. Maybe a crowd funding model might work better and this is one option we will look in the future. On the other hand the ‘big bang’ option does carry the risk that the initial support will run dry before the second wave can pick up the slack, or the second wave isn’t as significant as it needs to be. It is hoped that this is not the case with SRB as the initial reviews and articles suggest that it could become a very influential site for Australian literary criticism if it can attract the ongoing support it needs. Another point made by SRB which I found interesting was the statement that the site was “sparked by concerns about the dwindling space for literary criticism in Australian media”. In light of the recent discussions about the role of the mainstream media (msm) in the current political debate and the increasing importance of alternative voices, such as political blogs and movements such as ‘Destroy the Joint’ (http://www.destroythejoint.org/)which have embraced social media, I began to wonder about the role of the mainstream media in Australian literary criticism. First of all what do mean by ‘mainstream’ media in this context? The art and literary pages of the weekend papers obviously. The various book shows on Radio National – well they are definitely dwindling! What about the existing set of funded literary and cultural journals? A number of these have used the web to increase the amount of criticism they publish (while some such as Cordite and Mascara are purely online). I can’t really see a dwindling here – in fact if anything the amount of reviews and articles seem to be increasing in this area if anything (the new ‘Cordite Scholarly’ section (http://cordite.org.au/content/scholarly) being a case in point). While it maybe possible to argue that has been a reduction in traditional outlets for literary criticism over recent years it is important not to forget the plethora of non traditional or non-mainstream outlets. Many of these are on web only publications – but while the web has made it easier to publish and distribute, these publications are doing much the same as the small magazines and presses were doing for years – flying under the mainstream radar and often pushing boundaries. One one level you have journals like Verity La (http://verityla.com) which continue to regular publish insightful reviews and interviews. Is Verity La part of the critical literary ‘mainstream’? Probably not but it continues to push boundaries and ask questions. One of the biggest areas of growth, in my opinion, has been the explosion of blogs about books and writing. While it might be difficult to class many of these as containing ‘traditional’ literary criticism, quite a few of them do and by overlooking them you are overlooking one of the most vibrant areas of literary discussion. But even if a blog or forum does not fit the traditional model they are also adding to the discussion and increasing the potential readership base for many new literary publications. So while the appearance of the Sydney Review of Books is to be applauded and I hope that becomes a important part in the ongoing literary discussion, I think it is also important to recognise and value the importance of the smaller, often non-traditional, publications (both on and off-line) which continue to drive much of the vitality and excitement in the current literary environment. So why the reference to Krakens? 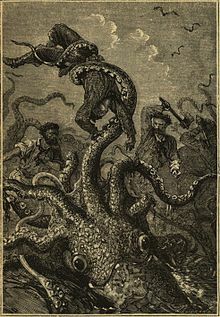 Besides from the fact that I have always wanted to include ‘Kraken’ in a title and the obvious references to mythology, Tennyson and Wyndham, I wanted to labour the image of the depth and diversity of Australian writing a little. The mainstream literary journals are the ocean liners on the surface of a vast ocean in whose depths lies all sorts of strange and wonderful things. This diversity needs to be accepted and celebrated….otherwise it can rise up and crush the largest ocean liner….Happy sailing! This entry was posted in Administration, Issue 6 and tagged Cordite, Destroy the Joint, literature, Mascara Literary Review, The Sydney Review of Books, The Writing and Society Research Centre, Verity LA by Mark Roberts. Bookmark the permalink.